Whether from our Collections or our Bespoke Service, we offer hospitality designers and specifiers the ability to realise unique, differentiated high-end interiors. We have featured in hotels as far flung as the Grand Hotel Quellenhof in Bad Ragaz, Switzerland; Mandarin Oriental in Kuala Lumpur, Malaysia; the Shangri-La in Beijing, China; the Four Seasons Hotel in Mauritius; the Sandy Lane Hotel in Barbados and the Yas Hotel in Abu Dhabi. The historic Hotel Vier Jahreszeiten Kempinski in Munich was re-furbished in 2018. 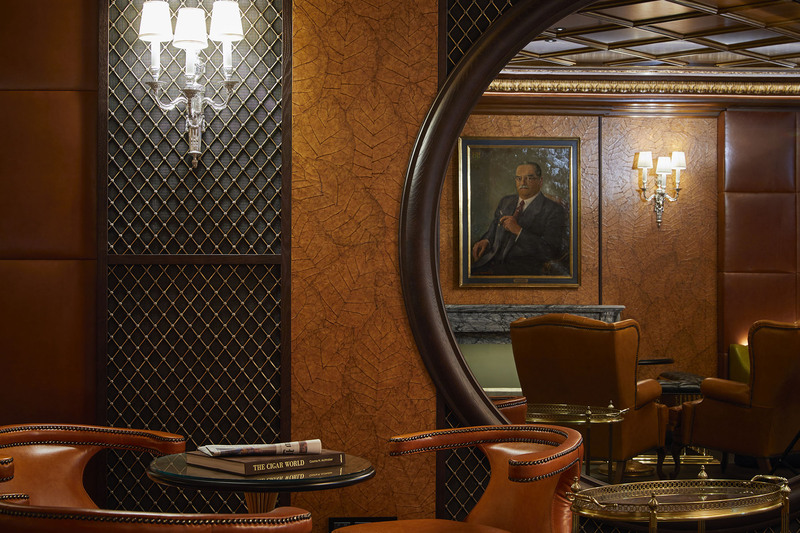 Here, the designers have used tobacco leaf panels from our Select Collection to great effect in the cigar lounge. 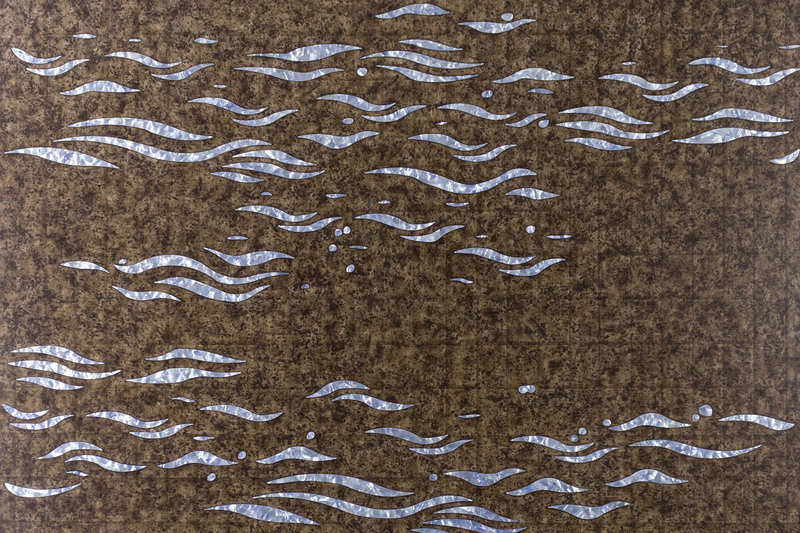 There are also table tops in matching tobacco leaf from our Essentials Collection. 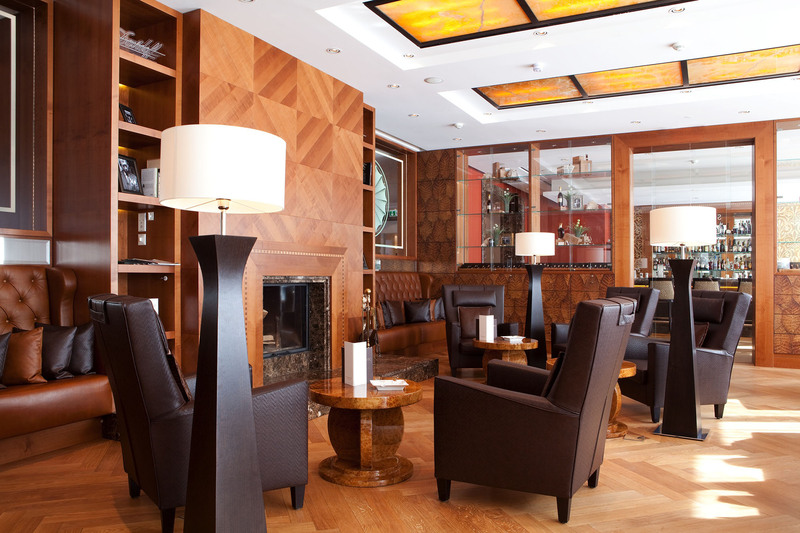 Our tobacco leaf panels were first used in a smoking lounge in the Grand Hotel Quellenhof, Bad Ragaz. This hotel was featured on the BBC’s Amazing Hotels of the World series in 2018. They were complemented by bespoke furniture in the same leaf surface. 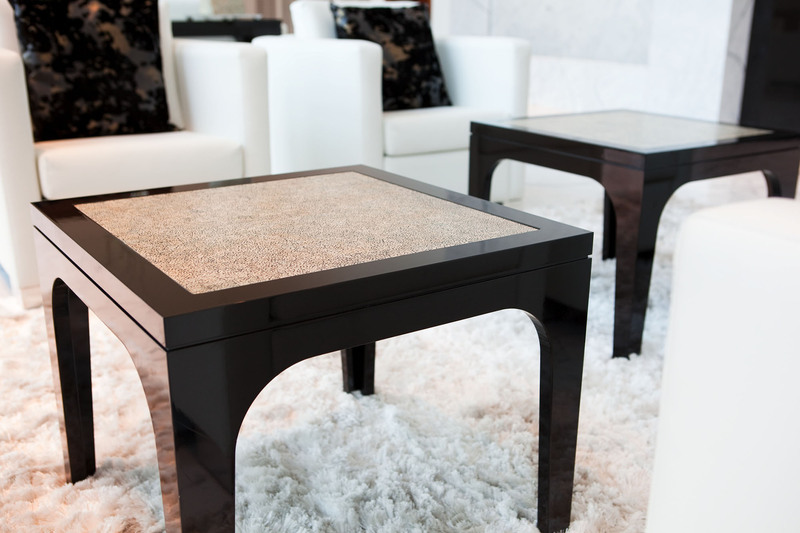 The public areas from the same hotel feature tables made from our Hatchet Shell Gaya surface in black and white colourways. Using our Essentials tabletops in a variety of shapes and sizes gives visual interest and definition to the different public areas. 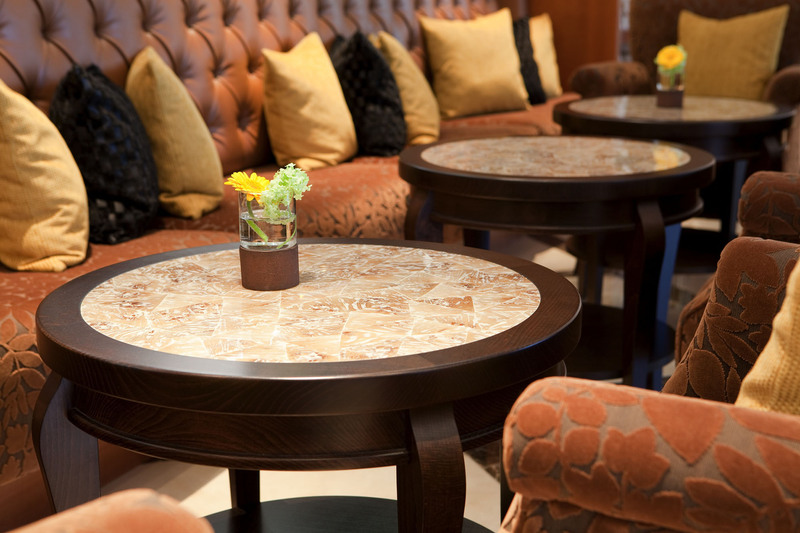 The same Hatchet Shell Gaya surfaces reappear in the elegant and understated Parsons tables in entry halls. Elsewhere in this lavish Hotel complex is a bespoke blue cracked eggshell surface applied to sculptural lamp bases and to tables. This project excellently illustrates the versatility of our surfaces in different schemes, styles and contexts, allowing designers to exercise the full scope of their creativity. 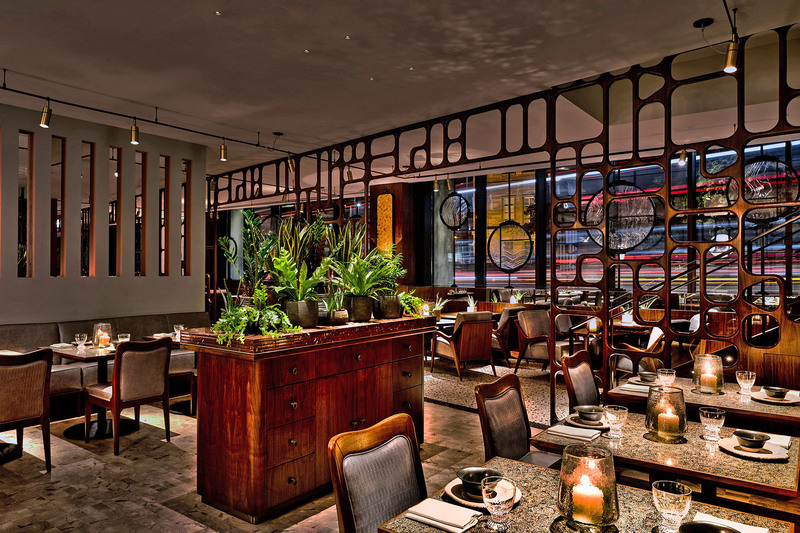 Our latest restaurant installation is in Martha Ortiz’s Ella Canta, in the InterContinental Hotel on London’s Park Lane. 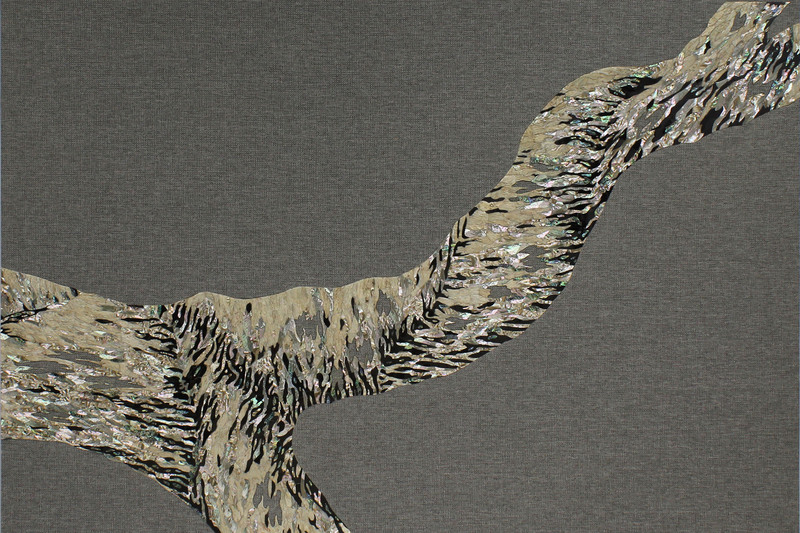 We provided the restaurant’s table tops in Eggshell Snakeskin Black. The tables are a key part of the restaurant’s modern Mexican vibe. Prior to specification, these table tops were “road tested” by the restaurant to satisfy themselves that they work sufficiently resilient for contract use. Needless to say, they passed with flying colours! We also work with art consultants to realise Bespoke concepts for public areas and suites. This artwork was developed for the suites in Norwegian Joy, owned by Norwegian Cruise Lines, that was designed to operate in the China market. Norwegian Bliss is the sister ship to Norwegian Joy. The artwork we provided for the suites in Bliss have a different look and feel but in both cases, imbue their surroundings with distinction and character.